Bob, That was Jeff Davis. Charcoal powered garden tractor with the sun-shade. Okay thanks Mike, I tag him in my pictures but forgot he had the little tractor. Hopefully with the extra day added to the event, I will get to talk to more people and put names with faces. Hey Mike are we going to have a list of what we are bringing? Project and food ? I agree on the name tags.That way 5 minuts after i ask there name, it will seem like i remembered the name. I decided to simplify the sign-up form. From past years, People brought the food they wanted to bring, and it was all well appreciated. With the Lemler’s finding great places to pick up main dish items, any side dish, dessert, salad, or other yummy-thing brought has been well accepted. Folks unable to bring perishable food can just contribute more to the donation fund. Same with projects. Bring what you want to bring, we welcome all “portable” projects and pictures / notes from the “un-portable” ones!! I like that idea of pictures and notes from the unportable projects. Or even additional build pictures of the ones you bring. Kristijan just keep holding the their hand, I know they will not forget your name for sure. Dont feel bad about me on the memery thing, i will be 60 years young 2 weeks after argos , and i have had the short memery problem for as far back as i can or can not remember, hence why i have allways had a reading problems.I just dont try too hard too remember and or not worth worrieing about.Here tooday gone tomaro, life is about a vapor and then vanishith away, that last phrase is in bible some place. So I still have the semi axles henry Austin gave to me. I doubt that I will use them. If any body is interested in them, I am not that far fromArgos. a side trip worth making if you still need to build a chunker. 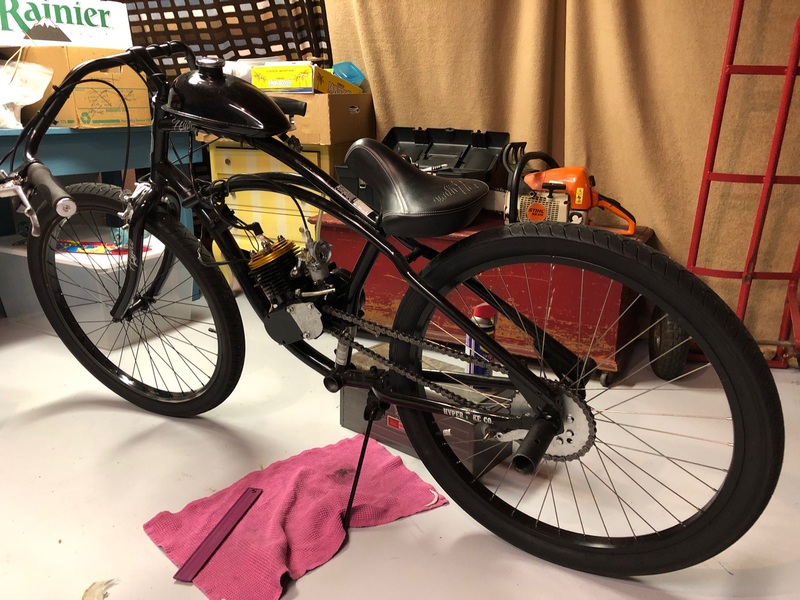 I’m planning to bring by motorized bicycle, well not a bicycle anymore, because I took off the crank assembly, but it’s pretty cool for a couple hundred bucks thrown together. It’s got a little 66cc Chinese 2 stroke motor, and with the high compression head, I can get it pretty fast. Too fast for a residential area (25mph). Tyler, Nice looking bike. I like the Retro / Modern mix! By all means, bring it with you! Hy andy i live in flint mi area, i may pick them up before argos if there nearly free. did you find out what gear it has in it , How far from flint would you be. Thanks.Email me the Details please. That sounds better too pick up on way home from argos. i could use at least one maybe someone needs the other one ? are they seperate.Thanks. They are still both connected to a section of frame, but i am happy to help you take one off. It takes a pretty hefty trailer to haul. Thanks andy if you still have after argos let me know im not sure about makeing argos this year.shedual is looking slim on time and money ratio at the moment, it may change before argoes hopefully.